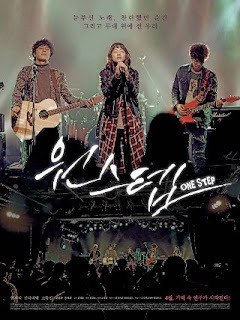 One Step (Hangul: 원스텝; RR: Wonseuteb) is a 2017 South Korean musical drama film directed by Juhn Jai-hong and starring Sandara Park, Han Jae-suk, Cho Dong-in and Hong Ah-reum. Its production was inspired by the domestic Korean success of the American film, Begin Again. Plot: After being involved in a car accident, Si-hyun (Sandara Park) is left with no memories of the accident or her past. The accident causes her to see sounds in color which is often disorientating, forcing Si-hyun to protect her ears. She encounters Ji-won (Hong Ah-reum) in the hospital and moves in with her when she is later discharged. Upon hearing Si-hyun humming a strange melody in her sleep, Ji-won's brother, Woo-hyuk (Cho Dong-in), writes it down as a score and gives it to her, hoping that it would help her remember something of her former life. Meanwhile, Ji-il (Han Jae-suk), a failed songwriter stumbles upon this score and offers to find the melody. They embark on a healing journey as they collaborate to complete Si-hyun’s melody.